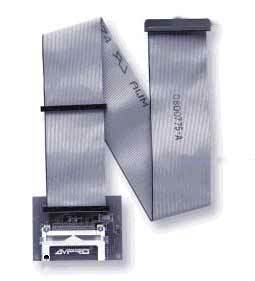 N/AFlash Adapter provides a rugged and flexible means to add a socket for CompactFlash removable-media solid state disk cards to systems based on the company's embedded PCs. The adapter is offered in two versions: one having a 40-pin, 0.1-in. IDE connector for direct cabling to a Little Board IDE interface; the other with a 44-pin, 2-mm IDE connector for direct cabling to a CoreModule IDE interface. Any cable length, up to 18 in., may be used between the adapter and the embedded PC module. The adapter's four mounting holes support rigid attachment to an embedded system's boards or chassis. Additionally, a retaining clip can be used to securely lock the card into its socket.